Everyone gathers around when it is time to cut the cake at a wedding. It actually may be the premier event at a typical wedding reception. There are a number of ways of photographing this moment and we try to provide our brides and grooms with a number of different angles and approaches. In this particular wedding photo, I used a high camera angle and aimed down at the bride and groom. My other wedding photographer was coming in a completely different angle. We try to vary our approach based up on the location of the wedding cake and the background. The size of the cake also makes a difference. 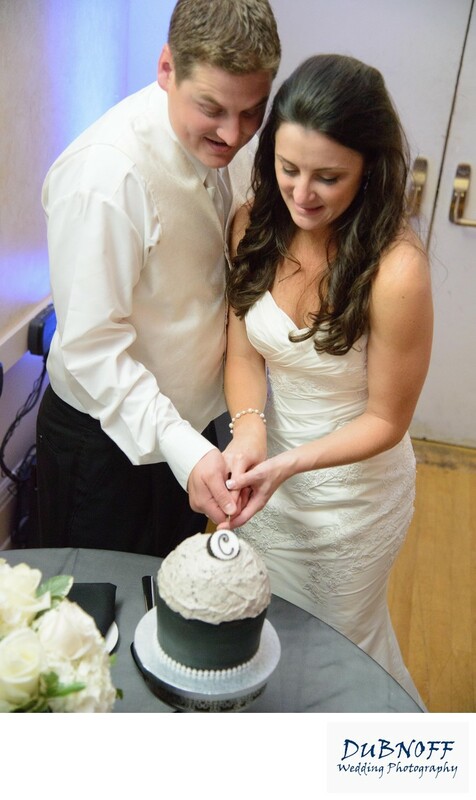 Here is a randomly ordered list of our different approaches to cake wedding photography. Bride and groom looking down at cake.